When the final buzzer sounded, it wasn’t the last unbeaten team in the nation to cut down the net, nor was it the player of the year. It was the Duke Blue Devils winning it all this year. 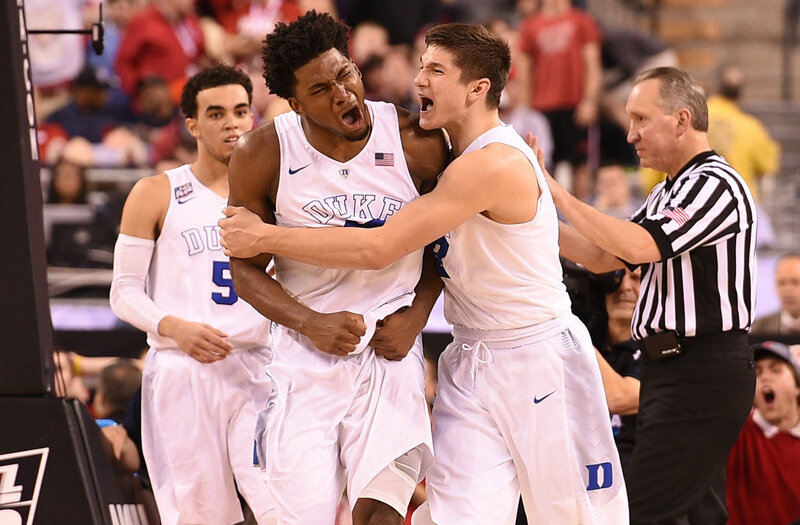 Duke was able to edge out Wisconsin for the second time this season, but this time winning meant more than just a W on the record, it meant the National Championship. Jahlil Okafor and the Duke Blue Devils beat Frank Kaminsky and the Wisconsin Badgers 68-63 in Monday night’s national championship game. Duke’s Coach Mike Krzyzewski claimed a fifth national championship Monday night putting him alone for second place all-time on the national championship list, behind only John Wooden. Krzyzewski is now 4-0 in his career in Final Four games at Lucas Oil Stadium in Indianapolis. Wisconsin’s senior center Frank Kaminsky, who recently won player of the year, could not win it all, coming up short of a national championship for Wisconsin. Kaminky led the Badgers to the Final Four last year before losing to eventual runner-up Kentucky. Both Wisconsin and Duke will have some big shoes to fill as both of their best player, Kaminsky and Okafor, will enter the NBA Draft and both will most likely go in the top picks of the first round.